Community United Methodist Church supports many missions both locally and around the world through the greater United Methodist Church. Locally, we have committed to financially supporting the Tri-Area Food Bank, Ecumenical Christian Helping Hands Organization (ECHHO) and Olympic Community Action Program (OlyCAP). On a rotating basis we send a monthly check that is supplemented by individual contributions and special fund raisers. Our “spare change” approach has proven very successful because all it requires is your pocket change which, when combined with everyone else’s contributions, really adds up. We also encourage our members to volunteer with these and other worthy non-profits that do so much for our local community. 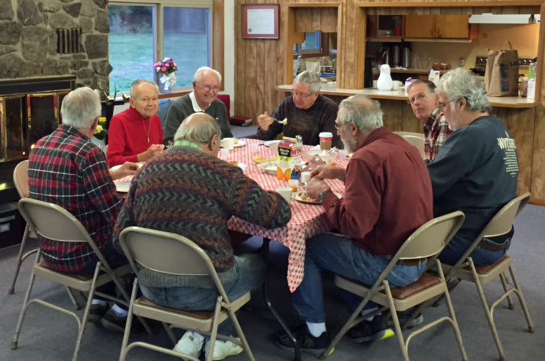 The Community Men meet monthly on the third Saturday of each month for breakfast and fellowship where we discuss our leadership roles as men within the church and have a short devotional. Meetings are the first Thursday of each month at 10:00 a.m. at the church. During my 35 plus years in the criminal justice system as a police officer, defense attorney and prosecutor I have seen first-hand how alcohol and drug addiction impacts the addict, their loved ones and society in general. Most recently, I was an elected Prosecuting Attorney who participated in a Drug Court. My interactions with these remarkable people caused me to realize that there is a real person struggling to get out and escape the hell they are experiencing. In the United Methodist Book of Discipline under Social Principles (paragraph 162 L) the Church states that it supports educational programs as well as other prevention strategies encouraging abstinence from illegal drug use. The Church holds that drug-dependent persons and their family members, including those who are assessed or diagnosed as dependent on alcohol, are individuals of infinite human worth deserving of treatment, rehabilitation, and ongoing life-changing recovery. Community United Methodist Church is committed to assisting those desiring recovery in any way we can and have gladly opened our doors to provide safe and secure places for recovery groups to meet. Worship begins and after the Children's Sermon the kids are released to go to their Sunday School class. Join us after the service for refreshments and conversation.